Joseph Maunder | Launceston Then! ‘Happy’ Joe Maunder stands outside the Race Hill shop with his grandson Bill looking on with his mother, Jessie . On leaving school in that hot summer of 1976 I went to work for Maunder and Sons of Race Hill. In fact the very same shop that we see in the picture above. For many they will remember the orderly line of wooden handles lined up along the wall from the shop nearly to the entrance of the Pannier Market on markets days. And oh, how many times did I hear the sound of those very neatly placed handles tumbling over, dominoe effect, as a pair of size 9’s accidentally caught them. There was also the danger of the passing cattle lorries spilling unmentionable contents as they slowly made their way up the hill to the market. But these are days I remember with fondness. Everyone knew and trusted each other and there was never any consideration given for the handles to go missing. It was a job that certainly kept me fit with the store further up the hill where Coodes solicitors are and I must have ran up and down that short piece of hill 100’s of times. I also learnt how whip and splice rope, make halters and cow ties and had the privilege of watching and helping Bill Maunder repair Church bell ropes. 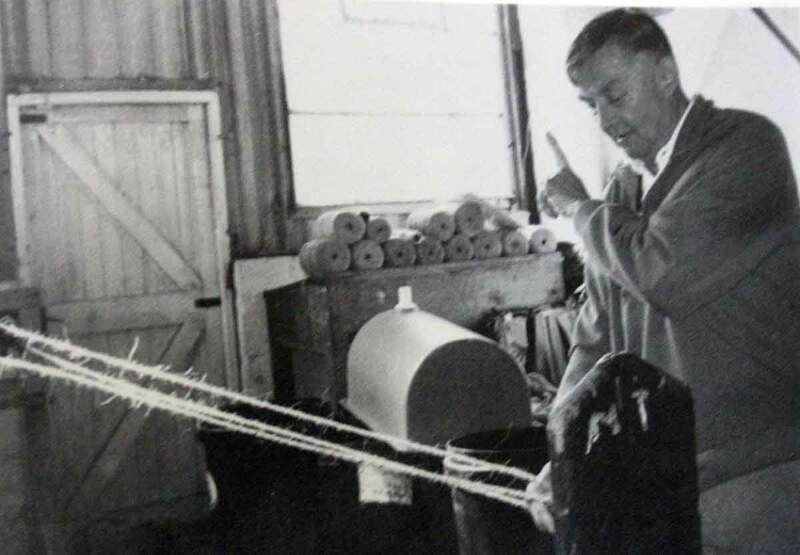 It is with rope making that the firm began in 1890, started by Joseph Maunder. Joe was born in April 1856 to Solomon (1809 -1884) and Lydia (nee King) Maunder in Southwark, London. His father was a Royal Navy pensioner having served in the Merchant Navy (21860), and was previously from Launceston. Solomon was unable to work as he was listed as being blind possibly from an accident with the merchant navy as he had been in Greenwich Hospital prior to the families move back to Cornwall. Joe married Selina Westlake in 1876 and together they had 12 children, Lydia, Edward, Henry, John, Bessie, Richard, Alice. William, Ellen, Kate, Annie. And Clara. (Selina was the daughter of John and Sarah Westlake and was born in 1857 at Launceston). Joe learnt his trade on leaving school working for Valentine Poad in a ropewalk which was located on the corner of Exeter Street (the Poad family also ran a bakery in Exeter Street). Up until 1860 the rope was actually made right across the road, one end being started in Mr Poad’s passageway and the other end set up on a made up device on the other side of the road. He worked from 7 in the morning until 7 at night, with no half days, earning 1s. 3d. a week. ‘Happy Joe’ started on his own in 1890, in a cottage where Clarence Terrace now stands, working hard to build it up by hawking ropes around all the local markets. Working in his back garden of his home in Race Hill, he would get up at 4 am to make his ropes not finishing until dark to make sure his stock was ready for the following days market. By 1900 he had a stall in Launceston market and his son’s William and Richard joined him in the business (Joe never paid any wages). Richard, when eleven years old, started going to Okehampton Market three Saturdays out of four, all on his own. He would walk the streets of Okehampton with the rope on his arm. When they started going to Holsworthy Market, Joe bought a stall. By that time Joe and his son’s were proving to be very industrious, turning out rope almost two to one over other people and the business boomed. Richard’s mode of transport was a bicycle he had purchased from Mr. William Prout, who sold them from his shop under the Liberal club. Richard first took on Callington Market and then Okehampton, but it was some acquaintances that he had met at Callington, who suggested he should try Liskeard Market. “They are starving for good rope at Liskeard; you could do well there,” he was told. Richard came to an agreement with a Mr. Truscott, from Rilla Mill, to take the ropes to Liskeard, and then he would push bike the nineteen miles to Liskeard. 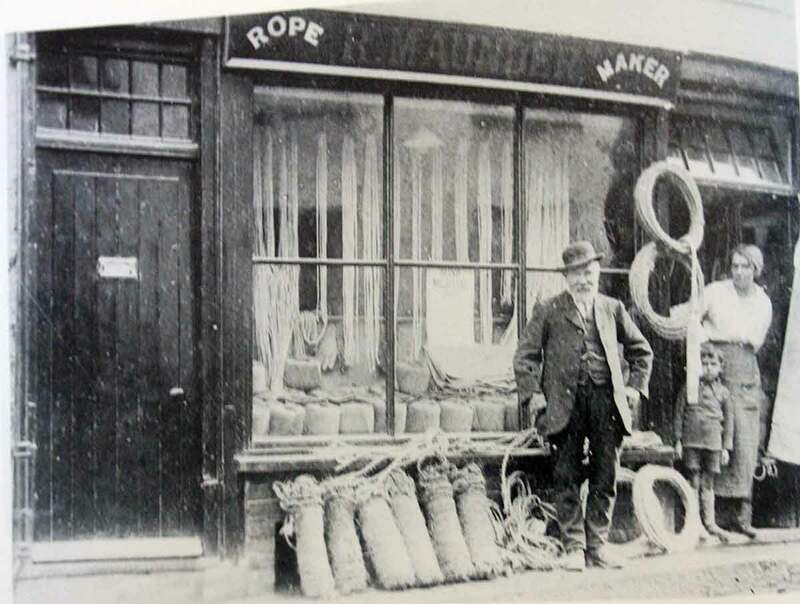 At that time the competition between the Poad’s and the Maunder’s had made the market for rope in Launceston very cheap and as a consequence, when Richard started to sell his offerings at Liskeard, people wouldn’t buy them because they were too cheap to be of any good. In the spring, plough-reins were the main line, and were offered for 1s. 6d. a pair. It was only when Richard put the price up to the local rate of 2s. that he started to make sales. With Ernie Poad giving up, Richard took over his stall just outside the Butter Market. In 1902 Joe and Selina had Laurel Cottage built in Race Hill with its own a large rope walk being constructed at the same time. Richard married Jessie Hocking from South Petherwin, daughter of Daniel Hocking. Joe retired when William, who had taken over the stands at Holsworthy and Launceston, left home and went to America. Even then, he was always busy, especially making rabbit nets. (Rabbit nets were very popular at this time, remaining so right up to the time of myxomatosis and after Joe’s death in 1923, Richard arranged with an Irish firm to machine manufacture rabbit nets to his specification, selling over 100 gross each season). During the first world war Harry and William lost their lives, both dying of their wounds within 6 months of each other which was a terrible loss to Joe and Selina. Richard also served in the war with the R.G.A. and fought at Vimy Ridge. Richard travelled across to visit Harry in hospital but was a day too late. The chaplain at the funeral was the Rev. Mr. Jones, who had lodged in Race Hill several years before, when he was curate to the Rev. Nunns at St. Mary’s Church and who had taught Richard in the Church Sunday School. William and Harry are buried side by side. Whilst he was away, the premises of Arthur Whitford’s tinplate shop at 3, Race Hill, became available at the hefty sum for those days of £300. With the Butter Market in the square being demolished and all the stalls being moved off the square, Richard faced losing a place in Launceston to trade. With his wife’s persuasion Richard and Joe took the property on. Joe passed away on the 20th of November 1923 and in his will he left his effects to his son Richard and Herbert Charles Foley Peake (accountant) to a total of £4,712 11s. Richard and Jessie had 5 children Enid, Richard junior, William (Bill) , Joseph and Harry. Richard junior, William, Joseph and Harry all served during world war two with Richard as a Pilot Officer with the RAF and William as a Captain in the Army. Unfortunately Richard lost his life in 1942 . On their return from the war, Bill and Harry returned to work with their father in the firm. After the war there was a resurgence in people wanting to provide for themselves especially keeping their own chickens and Richard saw an opportunity for increased business by selling chicken coops, houses, feeders etc. This enabled the firm to grow and a shop at Holsworthy (taking over the ironmongery and china shop of Mr. Tom Rees) was opened along with a lock up store at Liskeard which was open on the market days of Monday and Thursday. The old Laundry opposite St. Marys Hospital was purchased as an extra store. The wool store, in Race Hill (now Coodes Solicitors) of Charles Gillbard was also purchased. Richard passed away in 1969, leaving Bill along with his son John to run the Launceston shop and Harry the Holsworthy shop. 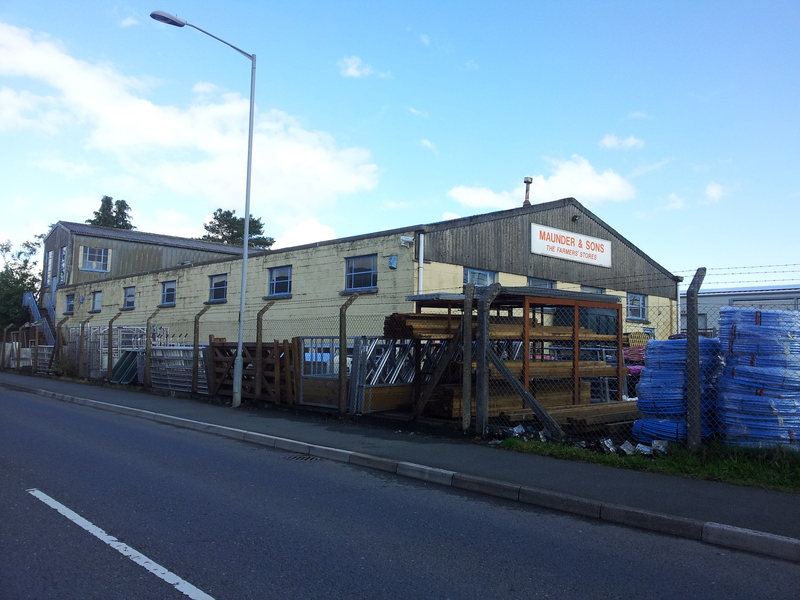 The Launceston business continued to grow and with a need for larger premises the old carpet factory at Scarne (above) was purchased in 1983 which ran in conjunction with the Race Hill shop. Bill sadly passed away in 1997 and with it a lot of experience was lost. 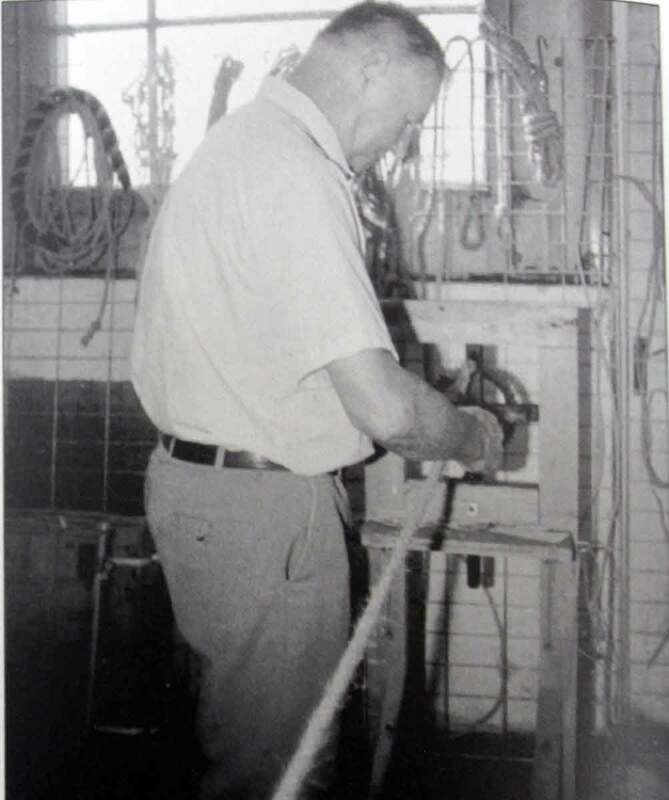 John with a few of the remaining staff still participate in the making of halters, but with mass production and a smaller market there is a reduced need for manual rope making. I spent a lot of time working with Bill (above) covering Liskeard Market twice a week and more importantly helping with his rope making, especially when he was tasked with repairing church bell ropes. This was quite a pains taking job which required patience, experience and skill. Not from me though as my task was to man the spinner and slowly wind the three lengths of thread as Bill would attach the old rope to a new piece. Now this sounds simple and it is, except, the mind must never wander! 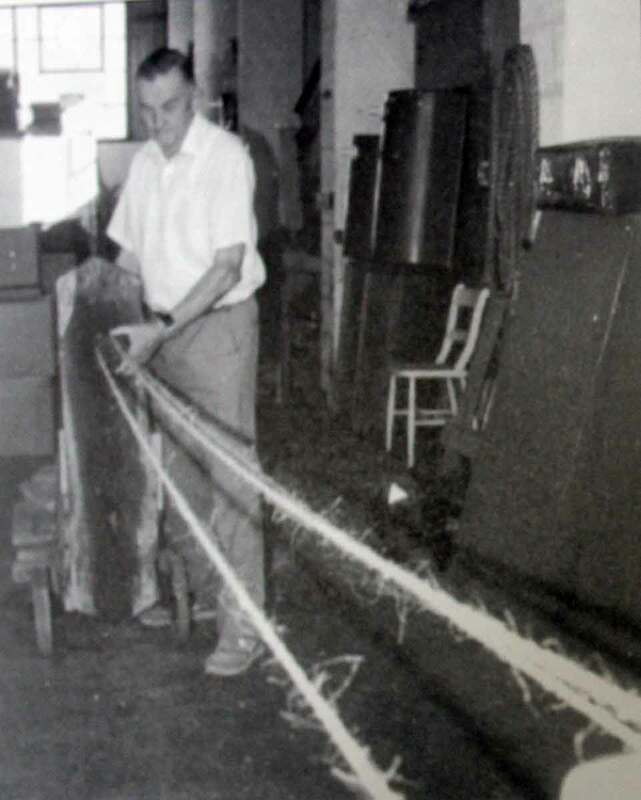 I remember one particular incident in the late 1970’s, I think it was a repair to the St. Issey church bell ropes, Bill had spent an inordinate amount of time preparing and slowly threading the pieces of rope together and trimming the sally with me just winding the spinner as to his order. I shall never know how it happened, mainly as I had drifted off and with a loss of concentration I lost my grip of the spinner handle and nearly two hours work was unravelling before my eyes! I looked down the walk and my gaze caught Bill’s horrified look, I immediately realised that I was in a bit of trouble and there was one of two things I could do. One was to let the rope completely unravel, not an option considering Bill’s reddening face, or stick my hand into the speedily rotating handle of the spinner and stop it, the only option! Well it hurt but I did save myself from the worst of Bill’s wrath although I did get quite a lecture which began with “young man, when I was in the war”…………………………………….